Blueberry crisp isn’t just for the summer months. 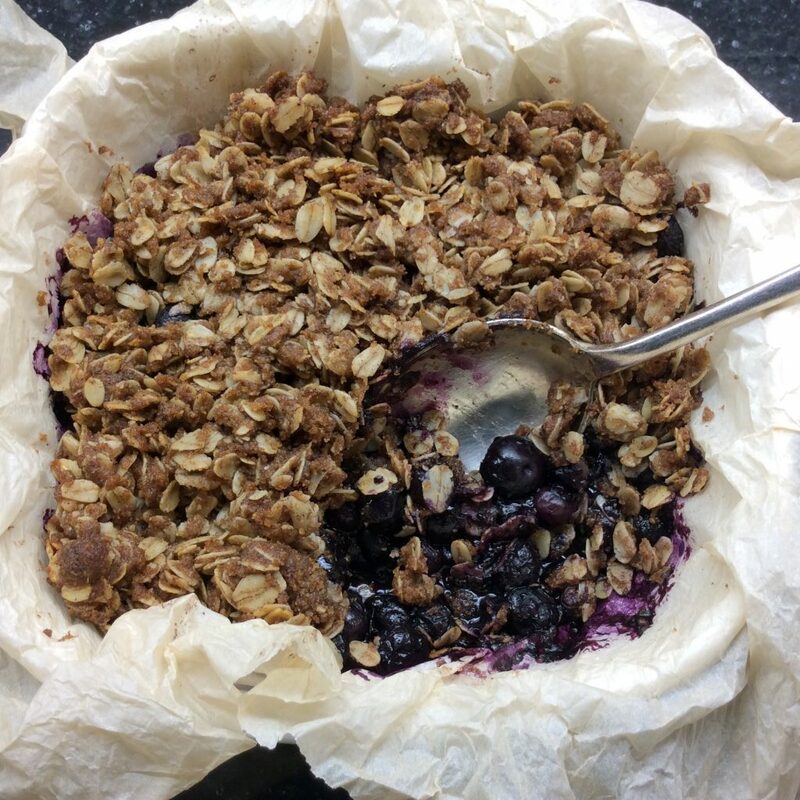 Use frozen local blueberries for a hint of summer in the middle of winter when you bake up this heart healthy blueberry crisp. I always switch to frozen local berries in the fall and winter months. It saves me money at the grocery store and the frozen berries taste better than the fresh imported berries at this time of the year. Plus I choose local berries. Canadian consumers: Check the back of the package to make sure you are getting a Product of Canada berry. 2. In a medium bowl stir together the oats, flour, brown sugar and cinnamon. Using a large spoon mix in the canola oil until well combined. The mixture should look wet. 3. Place the berries into the prepared pan. Sprinkle with the tapioca and cinnamon. 4. Pour topping over the berries. Press down lightly. 5. Bake for 66-75 minutes or until bubbly, yes, the frozen berries take longer to cook. I like to make this dessert when I’m already using the oven for roasting a chicken, cooking a roast or baking potatoes. 6. Serve warm or cold. Store any leftovers in a covered container in the fridge for up to 3 days. Wet parchment paper? Are you kidding? No. When you’re baking or roasting something in the oven; to help with clean up, thoroughly wet a piece of parchment paper. Squeeze out excess water and line your baking pan with it. You will never have to scrub out a casserole pan or baking dish again. Most excellent. And you’re welcome. Why are there so many calories in your crisp? To make a crispy topping using old fashioned oat flakes I used ½ cup (125 mL) of heart healthy canola oil. You can either do two things – One, make this with ¼ cup (60 mL) canola oil and reduce the grams of fat by half, or leave it as is and enjoy it on a day that was on the lower fat side, but remember heart healthy fats eaten in moderation are a good thing. We are always looking for great tasting food that has a lower calorie count to serve in the B&B. Love watching your segments on Cityline! I thought canola oil was not good to use. Canola oil is a heart healthy fat that contains omega-3 fatty acids and is extremely low in saturated fats. It is the oil that the American and Canadian Heart Associations approve of. I am going with the long term science on this one and it’s the oil that I choose to use for my long term health. My new cookbook Homegrown Celebrating the food we grow, raise and produce has the Carb Counts listed for each recipe as well as the naturally occurring sugars versus the added. I totally agree that all recipes should have that information. Thank you for bringing it to my attention, this is an oldie but a goodie recipe and one that I created years ago before I started listed the sugars. I’ve added the Total Sugars as well as the Natural Occurring and the Added Sugars. Hope that helps. There is so much nutrition noise out there its hard to wade though the messages. My go to for facts are professional home economists PHEc’s, RD’s, Harvard Health, Mayo Clinic, and other reputable sources. But, if you have any questions, please ask me.